What Is Wind Turbine Syndrome? Dennis and Carolyn Stillings moved into the country to enjoy the serenity and beauty of the rolling prairie near the Sheyenne River Valley.But now Carolyn sleeps with earplugs and sometimes finds the farmstead’s old chicken coop, well insulated and being converted into a studio, the only refuge from the noise. Dennis plans to get a decibel meter and keep a sound diary to document the drone they complain has brought an industrial soundtrack to their idyllic country retirement home 15 miles northeast of Valley City, N.D. The noisy neighbors: a wind farm of turbines, with their triple-blades turning like a fleet of gigantic pinwheels towering over the prairie. Beyond mere annoyance, Dennis Stillings wonders whether the chronic effects of the turbines, which sound at times like the dull roar of a jet engine overhead and a dishwasher at others, can over time lead to health problems. Complaints about noise and possible health effects from wind turbines arose at a recent public hearing concerning a proposed 157-megawatt wind farm near Luverne, N.D., in Griggs and Steele counties. The Stillingses and several other rural residents who live adjacent to nearby wind farms testified that they are bothered by turbines, even though they comply with the North Dakota Public Service Commission’s setback requirement. NextEra Energy, the company behind the Luverne wind farm, maintains that an analysis by a consultant concludes that the project’s turbines would comply with federal noise standards. But those very standards are coming under increasing scrutiny by critics. The complaints—deemed the first serious opposition to a wind farm in North Dakota by one Public Service commissioner—come as the members prepare for a formal rule-making process to set the minimum distance between wind turbines and dwellings. Commissioners have adopted 1,400 feet—approximately a quarter-mile—as the minimum setback for wind turbines as a health and safety precaution for nearby residents. But the turbines from the Ashtabula Wind Energy Center closest to the Stillings’ home in Barnes County are a bit farther than 1,400 feet away, yet still irritating despite their shelter belt, the Stillings say. Helen Corlew and her husband live in rural Petersburg, N.D., three-fourths of a mile from a turbine erected seven years ago. Corlew is bothered not only by the noise, but also by a vibration that she feels throughout her body under certain conditions. Jim and Mary Ann Miller live and work on a farmstead north of Luverne near several proposed wind turbines. They manufacture competition-grade dogsleds, and keep 21 Alaskan Huskies. “These turbines produce noise pollution, health risks, industrial electrical pollution, annoying blade-shadow flicker, ice throw and reduced property and land values,” Jim Miller says. The Millers and JoAnne Wold, who runs a nearby bed and breakfast, say they didn’t know the particulars of NextEra’s proposed turbine placements until they obtained copies of the project’s site map at the meeting. “I like the quiet. I hear things and I know by what I hear what’s going on around me,” says Wold, whose family has owned the land including her bed and breakfast for generations. Guests from all over the country come to experience the rural solitude and empty expanse of rolling prairie. Similar health concerns over wind turbines surfaced earlier this year in Clay County, where several large wind projects are pending. 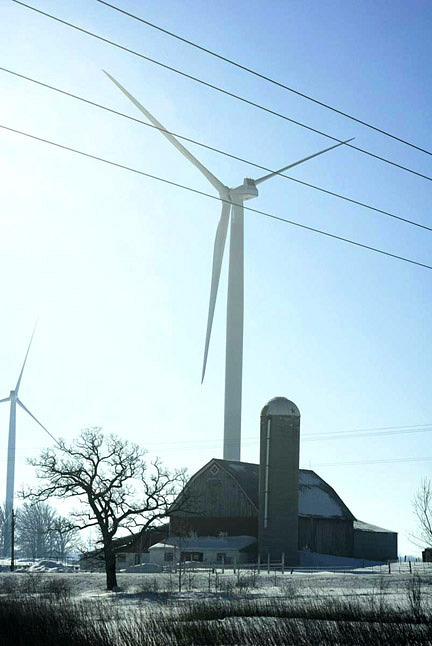 The county is considering a new zoning ordinance for wind farms with more stringent noise restrictions than those required by Minnesota law. A growing body of research, critics say, raises questions about the chronic health effects of noise and low-frequency vibrations caused by wind turbines. In Europe, which has a much longer history of large-scale wind farms than the United States, some expert panels recommend much longer setbacks. The French Academy of Medicine, for example, recommends setbacks of a mile, the minimum distance sought by the Stillings and others who raised concerns about the Luverne project. Some researchers contend turbines can cause earaches, dizziness, heart palpitations and sleep deprivation with diminishing brain function, findings that are disputed by other researchers. Documenting a possible causal link in chronic health conditions, which take years to develop, means people could be living at risk until results become conclusive, Dennis Stillings says. The PSC’s latest tally indicates 482 turbines in the state with a capacity of more than 715 megawatts. But wind energy is poised to grow exponentially in the state, with projects pending regulatory approval that could add up to 1,400 more turbines. “It’s safe to say that it’s just emerging,” says Public Service Commissioner Tony Clark, referring to complaints received about the Luverne wind proposal. The Public Service Commission is gearing up for a formal process, that will involve public testimony, to decide formal setback requirements for wind farms, Commissioner Tony Clark says. That distance, Clark adds, equates to a noise level for the nearest allowed dwellings of 45 to 50 decibels. In addition to state requirements, local zoning officials in North Dakota can set more stringent limits, he adds. NextEra Energy, a major wind developer in North America, occasionally receives noise complaints, says John D. DiDonato, the company’s vice president of development. So-called shadow flicker, a strobe effect than can occur when sunlight passes through turbine blades at certain angles, also can bother people who live near wind farms. Setback standards help to address both problems, DiDonato says. The World Health Organization sets 45 decibels as the maximum noise standard for people living near turbines. When the commission holds formal hearings, which are not yet scheduled, it will hear from experts on noise and possible health effects, Clark says. “At the end of the day, the science has to drive it,” he says.